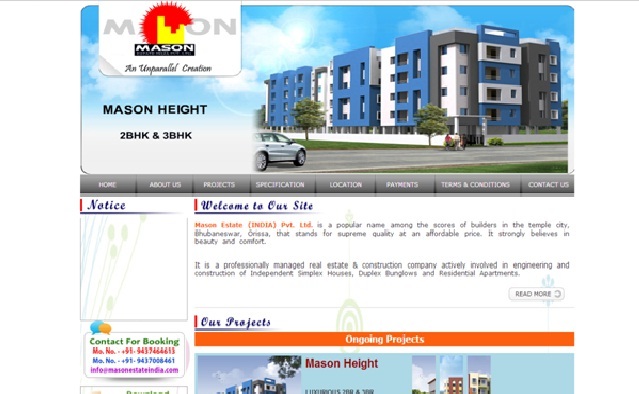 Manson Estate India (P) Ltd is a leading builders and developers situated at the temple city Bhubaneswar, Odisha. This company is committed to deliver the quality services and 24 hours customer supports. This company is managed by a highly professional team provides simplex, duplex, villas, plots, and residential apartments. This company handled 300 plus housing projects selling, buying and aims to give litigation free lands with legal documents and immediate registration, possession facilities. This project is located at Kalarahanga, Near to OSHB Colony, Bhubaneswar. This project has various modern amenities like Emergency power back up and 24 hrs generator facilities, 24x7 hrs Water supply, 24x7 Security, and Community hall. This project is located at Raghunathpur, Nandankan Road, Bhubaneswar. The features of this project are Individual boundary wall, Common water supply, Internal sub roads, Intercom, 24x7 Security, Children’s play ground, Club house, Multi gym, Jogging park, and commercial shops, School. This project is located at Patia, Near to Big Bazar, Bhubaneswar, Odisha. This project has various modern facilities are Emergency power back up, 24x7 Security, 24x7 Water supply, Intercom facility, and Community hall. Thank You iridia....for your nice comment..see u again here..